Sellers may wonder whether doing a short sale would affect their credit less than completing a foreclosure, and whether there are other advantages between the two. While in foreclosure, and depending on state laws, a seller could possibly stay in the property, essentially rent free, for four months to a year before being forced to vacate. But that fact alone does not mean a foreclosure is better. A short sale involves offering the home for sale, generally listed through MLS. Potential home buyers will make appointments to view the home, some will make lowball offers, agents might hold open houses, and, in general, a seller's life will be disrupted, all in the hopes that a buyer will buy the home. Short sales happen when a lender agrees to accept less than the amount owed against the home or because there is not enough equity to sell and pay all costs of sale. 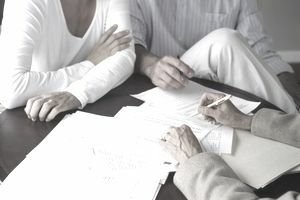 Not all lenders will negotiate a short sale, and that is why a real estate agent or a lawyer can be a tremendous help by contacting the lender's loss mitigation department to find out. You can't just wake up one morning and decide you're going to sell your home at a loss by asking for a short sale. It used to be that lenders wouldn't even consider a short sale if your payments are current, but that has changed. However, realize that lenders will be more agreeable to negotiation if your payments are in arrears. Plus, if you have cash assets, the lender might try to tap those accounts. How Is a Short Sale Seller's Credit Affected? Foreclosure or Deed-in-Lieu of Foreclosure: Both of these solutions affect credit the same, says David Steep of Vitek Mortgage. Sellers will take a hit of 200 to 300 points, depending on the overall condition of credit. This means if a seller's FICO score before the foreclosure was 680, it could dip as low as 380. Short Sale: Steep maintains that the effect of a short sale (providing the sellers are more than 59 days late) on a seller's credit report is identical to that of a foreclosure. The ding on credit will show up as a pre-foreclosure in redemption status, Steep says, which will result in a loss of 200 to 300 points. This means a short sale seller with a previous FICO of 720 could see it fall from 520 to 420. My personal experience as an agent has been somewhat different. I completed a short sale for a Sacramento seller who was 90 days behind on her mortgage. A few months after her short sale closed, she checked her credit report and found her FICO fell by only 100 points to 671. I suspect every seller's situation varies. Catherine Coy, a mortgage broker in Southern California, agrees with Steep. "The effect on a consumer's credit report—foreclosure vs. short sale—is the difference between being hit by a train or a bus," says Coy, speaking about borrowers who are a few months in arrears. However, over the years, short sales tend to carry less and less stigma. Foreclosure or Deed-in-Lieu of Foreclosure: Steep says a seller who wants to buy another home after foreclosure will end up waiting about 24 to 72 months before a lender will offer any kind of interest rate that makes sense. Coy says, "The good news is a short sale will allow the consumer to obtain an institutional loan for a new home within two years." Short Sale: Some agents say the good news for short sale sellers is the wait is much shorter before buying another home, and Fannie Mae guidelines in 2008 adopted new procedures. Can a seller buy again in less than two years? Not really, says Coy, "It's an utter myth that a consumer 'can buy again in about 18 months at a good interest rate." However, Fannie Mae guidelines now require only 48 months' seasoning, and that's not so good news for agents who specialize in short sales. FHA adopted guidelines in 2010 that says a seller who is current and does a short sale may qualify to immediately buy another home. Lenders aren't so quick to follow those guidelines. However, Flagstar Bank gave an Elk Grove short sale seller a new loan within two months of closing his short sale, and that seller was current at the time. FHA may approve a loan for a short sale seller who qualifies under its Back to Work program after one year. Note that Fannie Mae guidelines allow a seller to immediately apply for a new loan to buy another home if that seller kept the payments current, had no delinquencies exceeding 30 days and did not agree to repay the debt relief. Moreover, it's the late payments that dramatically affect your credit report, not the short sale. If you're a seller trying to decide whether to let a home go through foreclosure versus attempting a short sale, salvaging your credit may not be an advantage to doing a short sale, says Coy. She reports that according to "Score Factor Code #22, there's no credit score advantage for a delinquent borrower on a short sale over a foreclosure." I have my doubts about that, though. From what I've seen, there is less damage to a credit report after a short sale involving late pays than a foreclosure. Moreover, another advantage for those with delinquencies on their credit is the ability to buy another home using conventional financing within four years over the seven-year period required for foreclosures. Some lenders will make a loan for a new home the day after a short sale has closed. There are other short sale advantages over a foreclosure. But seek legal and tax advice before making that decision. How Soon Can You Buy a Home After a Short Sale or Foreclosure? When Should You Move out During a Short Sale?